A stunning exhibition dedicated to the life of a rock legend. Rarely have I used the words “must see”. However, the newly arrived and huge tribute to Phil Lynott truly deserves this praise. The exhibition, which had 30,000 visitors when it was staged in Dublin, has now come to London. The curator is Peter Emmett from Hot Press magazine which is an excellent fortnightly general interest magazine (with a fair proportion of music articles) from Ireland. 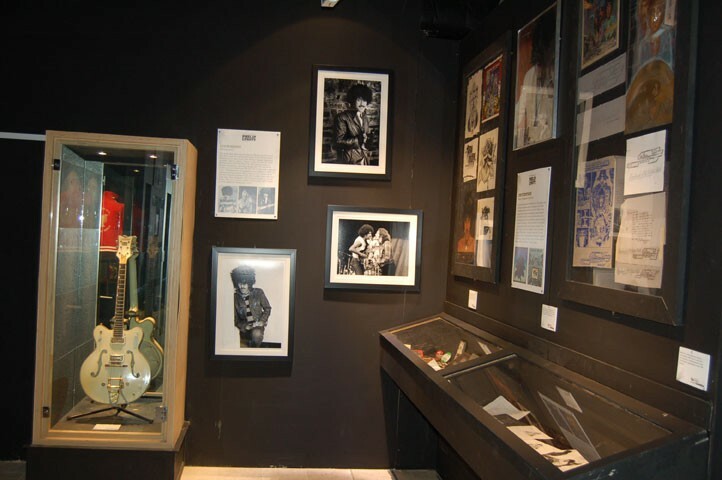 The exhibition is staged in the O2 arena in the London docklands just below the British Music Experience museum and buying a joint ticket means entry to the Phil Lynott exhibition costs only about £3 extra (i.e. £15 for both exhibitions). This will be the best £3 you will ever spend. The exhibition starts with tributes from the likes of Slash, Lemmy and Bon Jovi and sets the scene for how influential Phil was. This lead to endless displays of childhood memorabilia which was truly astounding, his school report (Phil was pretty clever by the way) being a highlight. Large billboards then charted Phil´s early bands, how Thin Lizzy formed, normed and stormed and then ends with Grand Slam and his untimely death. Pride of place was the Thin Lizzy family tree surrounded by rarities such as personal letters, hotel bills and photos galore and of course the majestic Thin Lizzy chrome and lights sign. One item which caught my attention was an early Seventies´ tour schedule, one day Swindon the next day Middlesbrough for not a lot of money. This then led to a staggeringly comprehensive set of album covers plus associated artwork from Jim Fitzpatrick and photography by Colm Henry showing how the Thin Lizzy trademark logo and identity developed. Still only halfway through, there was a nice opportunity for a rest and sit down watching Thin Lizzy live in concert on a cinema screen. 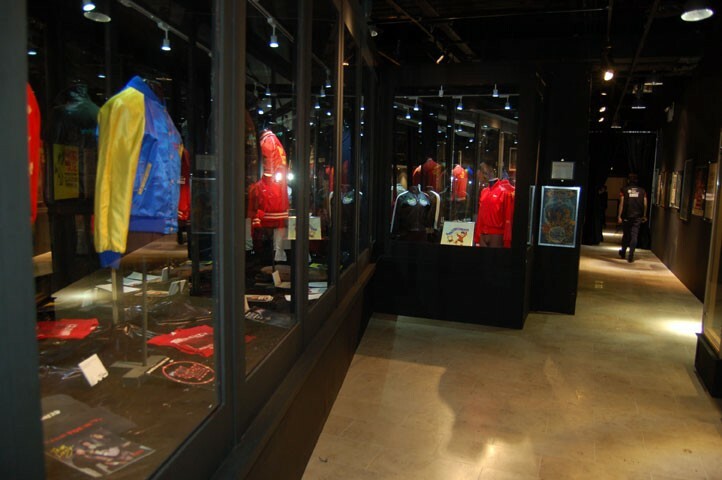 Refreshed, there was then an opportunity to look at a number of outfits that Phil wore (all six foot two of him) and more personal artefacts (postcards from Huey Lewis for one). Pride of place was a collection of Phil´s guitars including his trademark black Fender precision bass. An interactive pod with video clips of artists such as Joe Elliot and Bono giving tributes to Phil provided a nice ending to the exhibition. Ask Peter Emmett(lovely guy), anything. Who was 'Teddy'(Get m'records from the Rock on stall, Teddy boy you got them all), to the name of Phils dog. The man got the answers!!! We finished the tour and then did a second round. Each time getting told and asking him more questions. Plus, he listened and was very interested in any memories of Phil or Lizzy you had to tell. Thankyou so much Pete. The next aim after now meeting him is to meet Philomena. He knows her well too.